This lard is the only european one with the DOP mark. 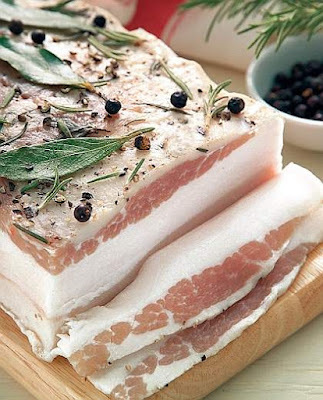 It is obtained from the pig fat, cut into pieces of at least 3 cm and placed in brine with herbs gathered in the area. The pigs, to respect the DOP mark, must have been reared only in some specific regions (Valle d'Aosta, Piedmont, Veneto, Lombardy, Emilia Romagna). In the production of the lard have to be observed two fundamental characteristics: the feeding of pigs, which excludes feedstuffs in favor of chestnuts and vegetables, and the seasoning of the lard thereof, for which are used local flavors and spices (garlic, rosemary, bay leaves, cinnamon, nutmeg, yarrow, juniper, cloves, sage). Everything stay closed under brine to mature for at least three months, inside traditional containers called "doils". Sometimes is preferred the long seasoning, in which case the brine is replaced with white wine. The final taste should be delicate, but well perfumed by the spices used. The Arnad lard is always eaten sliced thinly, placed on toasts and warm slices of polenta so that, when it melts, it gives off its sweet and gently aromatic smell. But the very traditional recipe made with the lard is the "Bacon du diable", whereby it is eaten on a slice of rye bread, toasted in a pan with garlic and spread with honey (or alternatively with "motsetta", another typical salami of the area).